A bit of search engine manipulation has provided insight into the content that Naspers’s soon-to-be-launched subscription video-on-demand (VOD) service ShowMax will offer — and revealed that the service could cost subscribers R99/month. 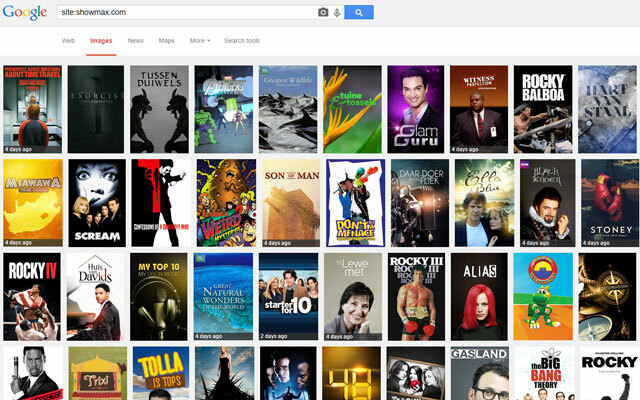 A Google image search against the ShowMax.com domain brings up a wide variety of images from popular movies and television series. Developer Shaun Trennery was the first to tweet about the cache on Thursday. The ShowMax website is currently password protected, but Google’s search robots have already trawled through much of the content. Most of the cache has been created in the past two weeks, suggesting the information it contains is relatively fresh. “ShowMax offers an unlimited video streaming platform, bringing you the best blockbusters, familiar favourites, series, kids shows, documentaries and actuality shows all in one place,” the cached “about us” section of the website reads. Naspers will launch ShowMax in Johannesburg next Wednesday, with commercial launch of the service reportedly scheduled to begin soon thereafter. The launch comes about six months after Netflix announced it was expanding to 200 markets around the world, including South Africa, by the end of next year. It appears the service will also offer a range of South African programming in addition to international fare. Searching the content cache suggests that Naspers plans to offer two subscription tiers — ShowMax Basic and ShowMax Premium. The Basic tier looks set to provide limited access to the ShowMax library, while the Premium option will provide unlimited access. Premium subscribers will be able to watch on two devices simultaneously. Up to five devices can be registered. It appears that Naspers intends offering users a free trial of seven days. Premium subscriptions could cost R99/month, according to the cache, though it must be emphasised that this is not necessarily final pricing. The cache also appears to show that ShowMax will be available only in South Africa. Also, content will be provided using “adaptive streaming” up to a resolution of 720p. Looks like Naspers is a bit shaky when it comes to Netflix, this is good for us consumers but knowing them the price increase will be yearly and end up being R800… let’s hope otherwise. So while Naspers might know something about pay-tv, they seem clueless when it comes to company confidential information on the web and letting the cat out of the bag. I don’t care about price, let’s compare content. I am highly doubtful that Showmax will have even 50% of the content of Netflix, but let’s wait and see. I think we all need to club in and buy Naspers a copy of “Internet Security for Dummies”. I am interested. But not more interested than in Netflix. Or it could be a well-thought out strategy to generate interest and hype about a forthcoming product, as is done with mobile phone “leaks”. Again it’s not likely their library will be bigger than essentially the entire Netflix catalogues South Africans using Netflix+Unotelly (+ the region switching UnoTelly provides with Dynamo) currently have. The pricing is competitive, but the content quality will be interesting to see.